From the cancellation in 2014 to petitions in 2015 to the upcoming release next week in 2018, Jesse Hernandez’ Tlaloc 8inch Kidrobot Dunny has seen it all! But we are super happy to say Tlaloc will be released Friday 14th December!! Just look at how f’n majestic this release is! This 8inch masterpiece wowed the crowds at DesignerCon last month, and now is your time to be wowed! Dropping on Friday 14th December. Priced at $99.99. Limited to 800 pieces for this particular colourway. We are lead to believe that there will be at least a second colourway of Tlaloc exclusive to Kidrobot.com on Release date! 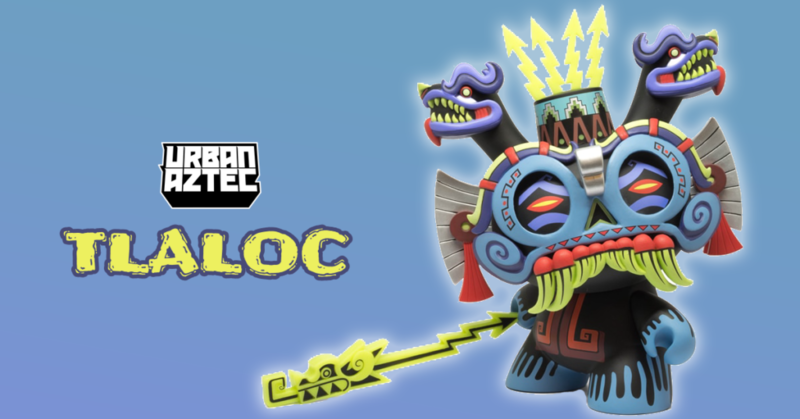 We have searched other Designer Toy stores and can only find a product page for Tlaloc on the myplasticheart page HERE. Collect & Display will have some stock too.